Combine the minced meat, garlic, breadcrumbs, beaten egg, ricotta, parmesan and herbs in a large bowl and season well with salt and pepper. Using clean hands, mix until well combined then shape into 20 meatballs. 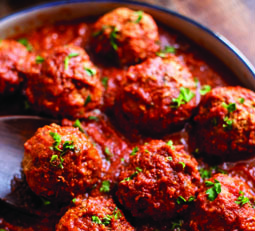 Place the meatballs on a plate, cover with plastic film and refrigerate for 10 minutes. Meanwhile heat the oil in a large heavy-based saucepan over medium heat. Add the onion, bay leaf and anchovy and cook for 5 minutes or until the onion has softened. Stir in the passata, chopped tomatoes and sugar, reduce the heat to low and simmer for 20 minutes. Season to taste. Add the meatballs to the hot sauce and simmer over very low heat for 10-15 minutes until the meatballs are just cooked, but still very soft and moist. Serve with a dollop of fresh pesto and a grating of parmesan cheese on top.